Traditional toxicology textbooks tend to be doorstops: tomes filled with important but seemingly abstract chemistry and biology. Meanwhile, magazine and journal articles introduce students to timely topics such as EPA and endocrine disruption or the carcinogenic effects of pesticides, but don’t provide the fundamentals needed to understand the science of toxicity. Written by a professor of toxicology, Modern Poisons bridges this gap. This accessible book explains basic principles in plain language while illuminating the most important issues in contemporary toxicology. Kolok begins by exploring age-old precepts of the field such as the dose-response relationship and the concept, first introduced by Ambroise Pare in the sixteenth century, that a chemical’s particular action depends on its inherent chemical nature. The author goes on to show exactly how chemicals enter the body and elicit their toxic effect, as well as the body’s methods of defence. 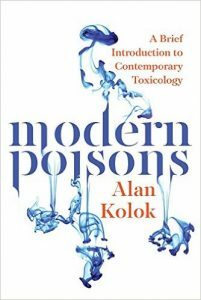 With the fundamentals established, Kolok digs into advances in toxicology, tracing the field’s development from World War II to the present clay. The book examines both technical discoveries and their impacts on public policy. Highlights include studies of endocrine-disrupting chemicals in toiletries and prescriptions, the emerging science on prions, and our growing understanding of epigenetics. Readers learn not only how toxic exposure affects people and wildlife, but about the long-term social and environmental consequences of our chemicals. Whether studying toxicology itself, public health, or environmental science, readers will develop a core understanding of, and curiosity about, this fast-changing field.